After the boil is complete it is important to chill the wort as quickly as possible. This helps reduce possible oxidation, prevents DMS from forming, and prevents contamination from bacteria and wild yeast. Cold tap water is used to chill the wort. Our target temperature is 68F for this Blonde Ale. If making a Premium Lager instead, it must be fermented at a lower 50-53F temperature if we are to retain the clean lager-like characteristics. If your tap water is above the target wort temperature then the water can be first chilled further by using a pre-chiller in a bucket of ice. 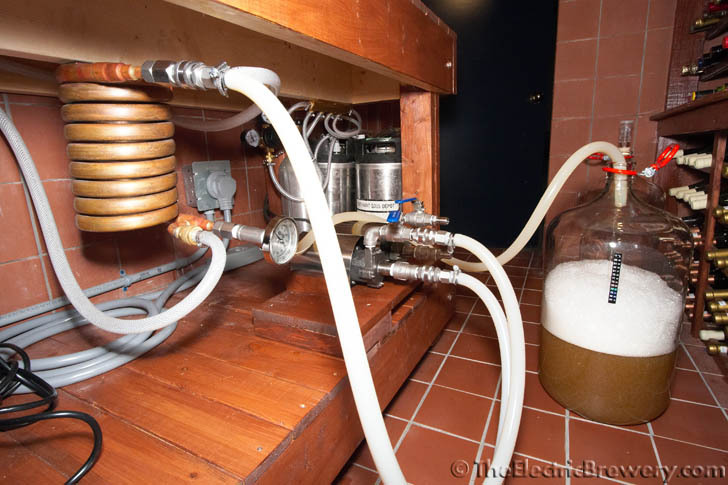 Another option is to chill the wort as far as you can using tap water and then let your home made fermentation chiller, regular fridge or freezer with temperature controller, or chilled conical fermenter bring the temperature down the rest of the way before pitching the yeast. Lagers require more chilling than ales due to the lower fermentation temperatures. 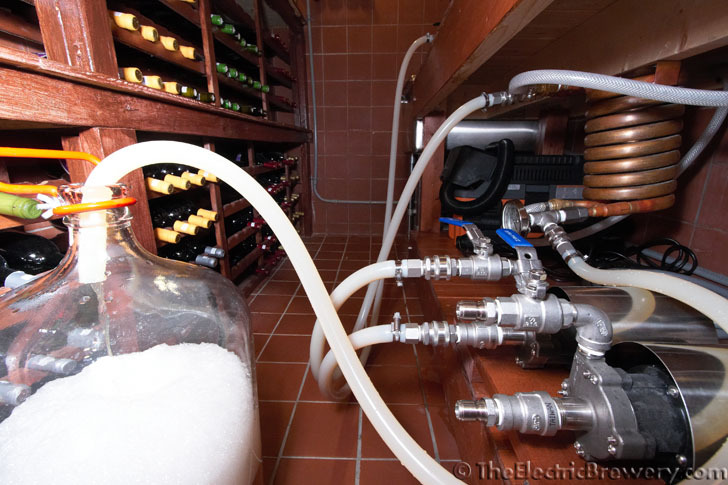 Many brewers without adequate chilling methods will resort to only brewing ales (which ferment well at near room temperatures) or only brewing lagers during the winter months when the ground water is colder and they have a cold spot to ferment in. Close all valves. 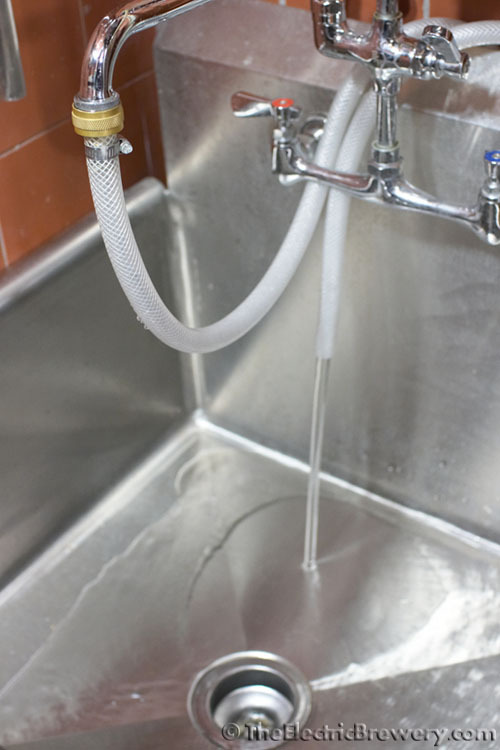 Connect hoses as shown in the picture below. Turn on the cold water source all the way. OPEN the Boil Kettle valve. Turn the WORT PUMP switch ON. OPEN the Wort Pump valve slightly and monitor the wort temperature using the thermometer on the chiller. Adjust the Wort Pump valve to increase or decrease the wort flow rate which in turn affects the final wort temperature: The slower the wort flow rate, the more the wort will be chilled. It should take approximately 15 minutes to chill the 12 gallons of wort. 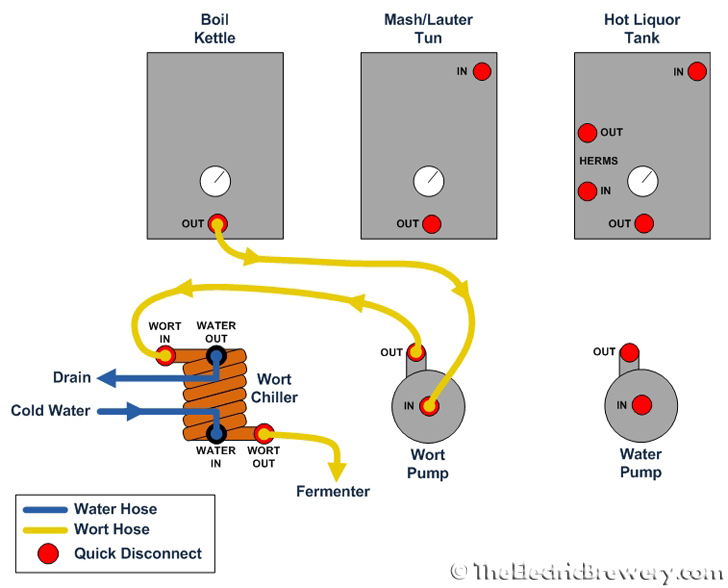 When the Boil Kettle is empty, turn the WORT PUMP switch OFF and close all valves. We use a Hop Stopper 2.0 screen in the boil kettle to ensure that hops and trub are not transferred to the fermenter. There is no need (or benefit) to whirlpooling when using a Hop Stopper. Start chilling immediately after the boil is completed. Measure the pH of the chilled wort using the pH meter if desired. It should be around 5.0 to 5.5 (measured at room temperature). Do not make any pH adjustments. We measure simply to keep records for possible future troubleshooting. Measure the post-boil gravity using the hydrometer and test jar to see if we met our target original gravity. It should be 1.048. 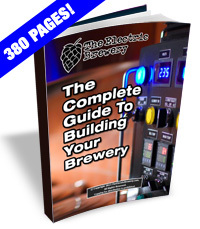 You can enter this number into your brewing software to have it calculate your system's efficiency. When the brew day is done, everything is cleaned. A soft sponge with hot water and elbow grease is all we use to clean the Mash/Lauter Tun and Boil Kettle. The Hot Liquor Tank does not need cleaning as it only ever has water in it. To wash out the hoses, pumps, and chiller we simply run hot water through them. When a thorough cleaning is required (every 10 or so batches), we use an oxygen based cleaner. It's a great (readily available) cleaner for stainless steel and the other materials used in our brewery. We heat up a scoop or two in the Boil Kettle and circulate it in all the hoses, pumps, and chiller to remove any build-up. A compact shop vac is used to blow out standing water from the various parts after cleaning. If brewing indoors with a hood fan, we recommend that you continue running the fan at low speed for a few hours after the brew day is done to help dry out the fan and ducts completely. Our cold water source is tap water. The heated water is usually discarded. By all means save it for laundry or other uses if you can!